Hello strangers! Been awhile since getting a wildlife post out and for that I apologize. This has been a crazy month already and as of tomorrow I officially enter crunch time on the Haunted Trail (only have ONE more week left to prep). I’ll post on it as soon as I can, but I did finish my final race of the season last weekend… well more like finished the last raceS of the season thanks to a two-race combo event. I can officially say that I completed my 4 half marathons in a little more than a month and a half. Must say, it about killed me (recall the last race recollection), but like they say, that which doesn’t kill me just makes me want to try harder hehehe. Oh well, plenty of time to talk about running later – we have a bird to get to! Pretty cool eh? I have to go it alone for this one due to my Brother Ron being uber-busy himself these days. I usually like to confirm my bird ID’s with him just to make sure. Bird IDing can be a bit difficult thanks to several bird species buying their coats from the same tailor. Always good to have an extra pair of eyes to spot nuances and Ron is really good at that. 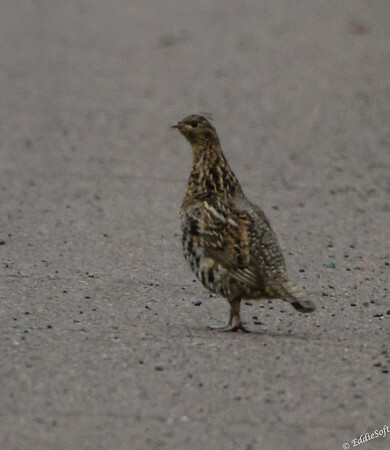 After doing some diligence on the web with some additional thumbing through my reference books I’ve decided this particular specimen is a Ruffed Grouse. 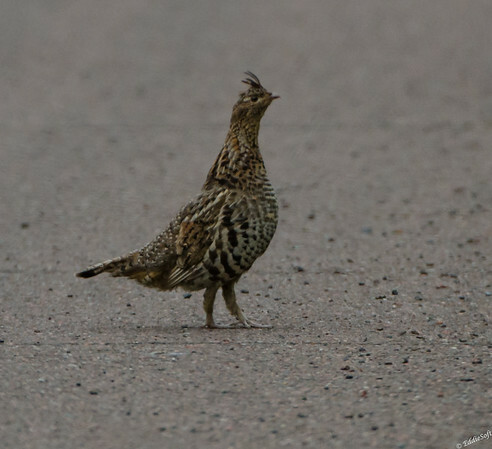 More importantly, for those of you keeping score, this (if correct) represent a new +1 for my birding list – YEAH. Hit the jump to read and see a bit more about this cool bird. 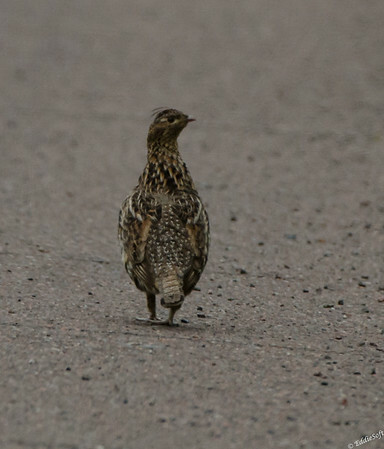 This specimen was spotted on our recent birding trip to Minnesota back in July 2017. We were headed up to Grand Portage to catch a waterfall for Linda. As bad luck would have it, it was drizzling as we navigated the highway that followed the Late Superior coastline. Linda was driving (no shock there) allowing me to focus on the scenery in hopes of finding something interesting hanging out on the shoreline. Not much there – unfortunately a common theme for the week we were up there. My disappointment suddenly turned to all out excitement when I spotted a large bird on the shoulder of the opposite side of the road. We zoomed past it, however, I saw just enough to convince myself we needed to try and get this one in the tin. Only one thing to do, give Linda our standard signal that I spotted something intriguing and we needed to turn around and go back. Yes, that is way too many words to describe the urgency of the situation so we have a single word that we use as the signal (no, I will not tell you want it is because it isn’t something you would say in public without being embarrassed). Usually Linda puts the nose of the vehicle on the ground trying to comply … this time she just kept going. Huh? maybe she didn’t hear so said it again. It took me some work to convince Linda on the importance of the situation. She relented and we turned back. By then we were pretty far away and hope was waning that it would still be there. As the miles ticked off (it took a while to find a good place to turn around), my doubt increased. Those were quickly put to rest when we rounded a curve and spotted the dark spot on the shoulder – still there. I had Linda pull off a ways from the bird. I learned early in my birding career to get shots in the tin and then try to improve on it. Lost too many shots trying to rush in and get the wall hanging shot. I jumped out and snapped a few shots and then started moving in on it. Linda was getting pretty nervous being on a desolate highway, in bad lighting not far off a curve. By then I knew it was a bird I didn’t have (wasn’t sure the exact species yet). In times like this, you need to live a little on the edge. Snap, move up, snap, move up, snap move up. The lighting was not ideal for the big glass and the drizzle was causing some focus issue. No complaints with what I did get. You can definitely tell the key features – barring vs spots, triangular crest, and if you look close at the tail you can see the black band. Those are the characteristics that led me to the Ruffed. That’s all I have for you today. Hope you enjoyed reading and seeing my latest addition to the birding list. Oops, looks like I fell down on the identification job. Sorry about that. 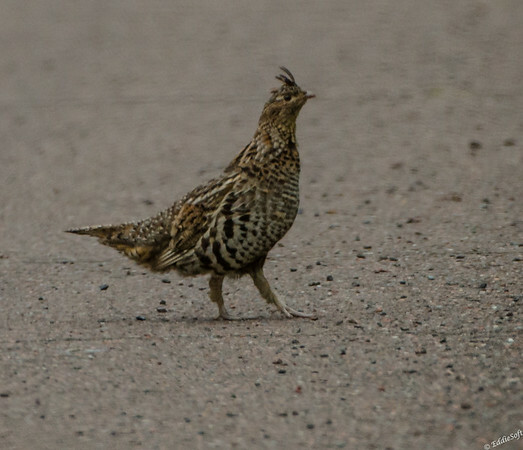 I think we confirmed it later, and it certainly is a Ruffed Grouse. I’ve never seen one, but I don’t hang around in Minnesota (hmm, it could actually be a large mosquito, now that I think about it). Sounds like Linda and you should share the +1, or +0.5 apiece for this one! No worries – I know you were even busier than I was over the last several months. You have been to Minnesota before if you are able to reference the size of their mosquitos. Still remember being laughed at by a merchant when we asked for firewood on a previous trip in the middle of July, Didn’t know why until we went to start it and was attacked by a mob of Crows err mosquitoes to the point we had to cowarded back into our tent. THERE IS NO SHARING OF POINTS – it is all mine and mine alone. I am the one who saw it and the one who had to argue tooth and nail to get her to even turn around. Next Next post: Wren Are You Gonna Stop So I Can Take a Pic?